Big oil will be big news all week. Here’s your guide to following along–and taking action. It won’t be a fun week for oil company bigwigs. As Matador reported previously, Wiwa v. Shell–a case almost 15 years in the making–will open this week in a New York City courtroom. The case brings Royal Dutch Shell to court and holds the oil company accountable for the deaths of Ken Saro-Wiwa and fellow activists in 1995, as well as other environmental and human rights violations. Jury selection begins on Wednesday, May 27, and opening statements are expected to be delivered the following day, according to the Center for Constitutional Rights. If you’re in the New York City area and are interested in attending the trial, it will be open to the public. The Center for Constitutional Rights is also seeking NYC-area volunteers to provide logistical support to Nigerian plaintiffs; more information about that can be found here. If you’re not in New York City, but wish to support the case against Shell, the Center for Constitutional Rights offers opportunities to host screenings of the documentary “Delta Force” or to help publicize the case via the Internet. Read more about those opportunities here. Over on the West Coast, another oil company will be on the hot seat. Chevron’s annual shareholders’ meeting is also scheduled for Wednesday, May 27, and will be held at Chevron’s headquarters in San Ramon, California. The meeting promises to be dramatic: the company is currently embroiled in its own lawsuit, which was filed in New York in 1993 and was later moved to Ecuador at Chevron’s request. The class action suit is believed to be the largest environmental case in history, representing 30,000 plaintiffs in Ecuador, who charge Chevron of gross environmental and human rights abuses. Shareholders may be happy with the company’s profits, but many have expressed concern about Chevron’s handling of the court case. New York State Attorney General Andrew Cuomo recently opened a probe of Chevron to determine if it is misleading shareholders, so passions are likely to be high at Wednesday’s meeting. Environmental and human rights advocates are expected to stage a protest outside Chevron’s headquarters the day of the meeting, and members of indigenous and farming communities from Ecuador’s Amazon will be present to address Chevron’s management directly. You can read background on the case and follow what unfolds this week here. 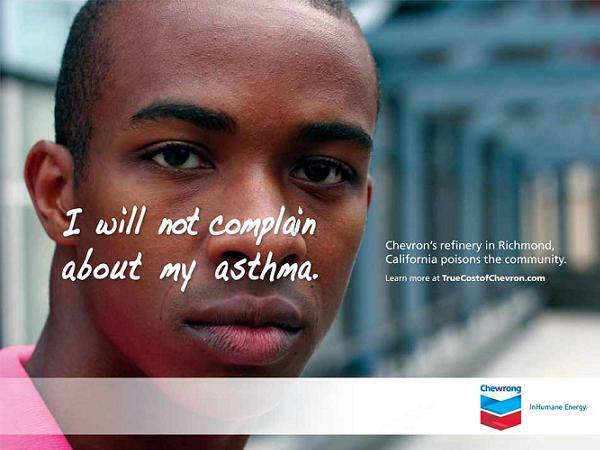 And if you’d like to send Chevron your own message, visit this site. Keep coming back this week to learn more about the developments in both cases, and to read first-hand accounts of people affected directly by Chevron’s actions in Ecuador’s Amazon.